There’s no excuse to not enjoy summer’s bounty in autumn or winter, especially with modern canned food options. I made a delicious crumble using things I had on-hand in my cupboard and it’s even dairy-free and vegan. You can cut out the sugar if you don’t like sweets and just enjoy the natural fruit flavors. 1. Blend the dry ingredients together. Set aside in a cool, dry container until ready to use. 2. Cut the peaches and apricots into smaller chunks and mix together. 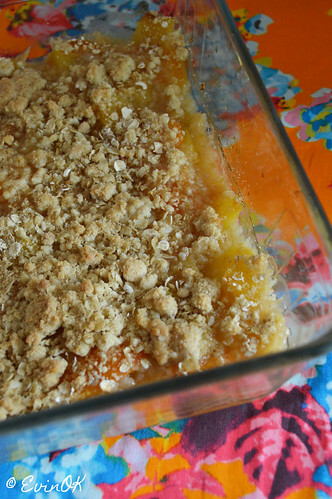 Transfer to a baking dish then sprinkle crumble topping over it. 3. Bake at 350F or 175C (with convection fan) for 30 minutes. 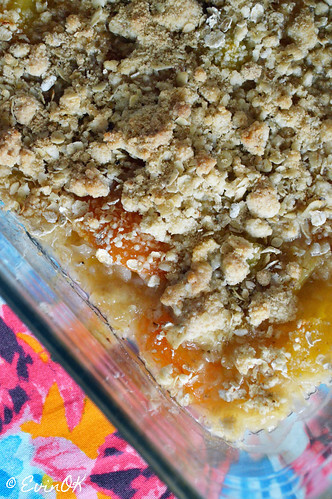 This entry was posted in Dessert and tagged Baking, crumble, vegan, Vegetarian.